Purim. The most debaucherous of Jewish holidays. Equal parts Halloween and Mardi Gras, with a pinch of drunk bacchanalia and drag show. This ain’t no subdued party. This is Purim! We celebrate clever, brave Queen Esther and pious, courageous Mordechai in their victory over villainous, treasonous Haman. There are plays and pageants of the story, costume parties, and we are commanded to feast and celebrate. And oh boy, do we celebrate! This year, I’ll pay tribute to a lesser known aspect of Esther’s story. She entered the King’s harem alone as a young woman, during the kingdom-wide search for a new queen. At the urging of her kinsman, Mordechai, she kept her Jewish heritage a secret. According to tradition, she may have still found a way to observe the laws of kashrut (kosher) in the harem by only eating legumes and fruits. 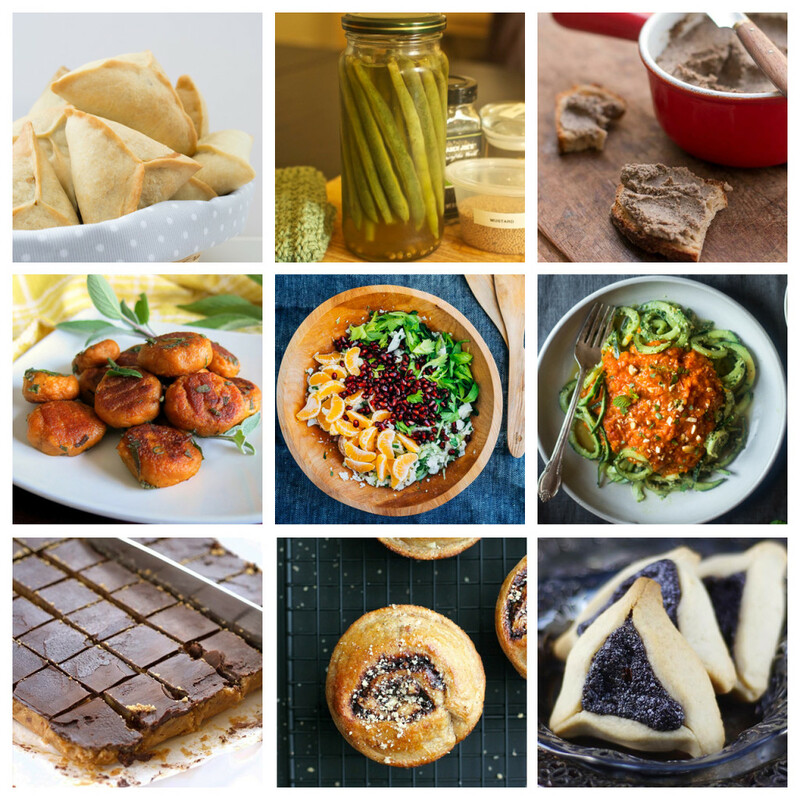 This is my round-up of vegan recipes worthy of a queen’s feast! Dainty and delicious, these Lebanese savory fatayer pastries by Tasty Mediterraneo are stuffed with lemony spinach. They look just like traditional hamantaschen/oznei haman. My Nosherium quick-pickled green beans are easy to make and perfect party food! Replace the honey with agave or sugar and snap! they are vegan! Going vegan doesn’t mean forgoing delicacies, so check out David Lebovitz’s mushroom and lentil pâté. Substitute butter with coconut oil and you’re set. I imagine it spread on some little toast slices with some berry jam. Gnocchi are so delicious, and I Deliciate’s gluten-free pumpkin ones have a gorgeous, golden hue that is absolutely regal. Pomegranate arils adds jewel-like color and juicy flavor to Brooklyn Supper’s citrus and cauliflower salad. The tahini dressing is one of my absolute favorites. This recipe by Taylor convinced me to try cucumber noodles. They are topped with a lentil and coconut curry. Saucy and exotic! These chocolate-topped caramel-y date shortbread squares from The Art of Veg are named Millionaire Shortbread, but I think I’ll call them Queen’s Shortbread. These chocolate and hazelnut buns from Happy Hearted Kitchen remind me of both nutella and babka, the latest Jewish food to go viral. They are made with spelt and olive oil for a rich, flavorful treat! And finally, hamantaschen/oznei haman. My recipe isn’t vegan, but I’m happy to give Unconventional Baker’s recipe a try – plus, it’s #glutenfree! Great compilation! The link for the hamantaschen didnt go through though. Can you please add? Thank you, Yehoysaif! I just updated the link and now it should work! Thank you for making such a beautiful recipe! It’s my pleasure! Thank you for the inspiration!